In the little moorland churchyard of Manaton stands a sad, time worn granite cross. It is hard to imagine that, not that long ago, the peaceful tranquillity of this Dartmoor parish was shattered by a bitter dispute over the church cross. For time immemorial there had been a tradition that when a coffin was carried into the churchyard it had to be walked three times around the granite church cross in a ‘sunwise’ or ‘deasil’ (clockwise) circle. The significance of this ritual had been lost way back in the mists of time and some thought it went as far back as the days of the ‘old gods’. Another theory was that this would confuse the spirit of the dead in such a way it could never return to haunt its earthly home. Regardless of when and why there was not a parishioner that dared bury their kinfolk without observing this rite for to do so would mean dire consequences for the poor departed soul. Stories of eternal damnation and everlasting purgatory were quietly muted outside of the church but as every coffin was all carried thrice around the cross the departed souls rested easy in their graves. That is until the fateful year of 1841 when the Reverend John Charles Carwithen came on the scene, he had duly been appointed as the new vicar for the church. It did not take long for the new incumbent to observe at first hand the ancient custom of ‘thrice around the cross’, and he soon came to the conclusion that this was an event that abhorred him. At first, not wishing to come too much of the ‘new broom’ he tried to gently persuade his parishioners against their blasphemous ways – but to no avail. Then came the fire and damnation tack where he vehemently spoke out about the foul heathen and pagan practice being carried out in the sanctity of his sacred churchyard – still to no avail. Poor Reverend Carwithen pleaded, threatened and prayed for a cease of the pagan practice until in the end he thought a missionary job taming the savages in Africa would prove an easier task. Finally the whole matter fell as silent as the grave which stood next to the heathen cross. Until that is one day when much to their horror the folk of Manaton noticed a huge void where the old granite cross used to stand. An immediate search began but all to no avail, the cross had disappeared and naturally fingers were pointed directly at Reverend Carwithen. The churchwarden even offered a substantial reward for anybody who could return the cross or make known it whereabouts – again, nothing. The local ‘newsin’ was of the opinion that that “meddlin’ pars’n’ had crept into the churchyard under the cover of darkness and smashed the ancient cross to smithereens, but nobody could prove it. Seven turbulent years later in 1848 the Reverend John Charles Carwithen left the parish for pastures new and even on his departure he threw no light on what happened to the ‘Heathen Cross’. The story now leaps forward 60 years to 1909 when some repair work was being done to the bells of Manaton church. One lunchtime Mr. Aggett of Chagford who was working on the bells decided to take a stroll and so ambled down a lane to a nearby stream. Here he noticed a strange slab which was holding up a wall that crossed over the gurgling brook. On closer inspection he noticed an inscribed cross and what appeared to be an arm. The vicar was summoned and pronounced that in his opinion the clearly was an ancient cross and that it must be the missing monument that once stood in the churchyard. A workforce was assembled and the cross was removed and taken to be re-united with the empty base that forlornly stood in the churchyard. It is at this point that the story takes on a Cinderella type scenario insomuch that the ‘glass slipper’ did not fit the eagerly awaiting socket. Clearly this cross must have stood elsewhere as it did not belong on the old Heathen Cross’s base. But being of the mind that any cross is better than no cross the Vicar had it installed on the original base like a cuckoo in the nest and to this day there it still stands. As to whether the coffins are still carried ‘thrice around’ that is for Manaton folks to know and everyone else to find out. Another Dartmoor funereal custom was that the sextant had to walk before the presiding clergyman with his shovel ‘reversed’ which meant with the head facing and infront of him. The number three has always been regarded as a mystical number and has been Christianised into representing the Holy Trinity so it is not surprising that the coffin had to be carried ‘three’ times around the cross. There have also been instances where a coffin has been placed on a cart that was drawn by three horses which unless the significance of three didn’t mean something would have been an arduous task. 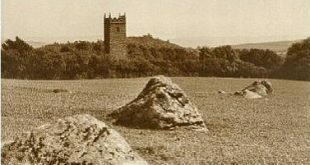 It could well be that in pre-Christian times a standing stone or menhir was used as the pivotal point of the ritual, indeed, less than half a mile from the church is a road junction called ‘Langstone Cross’ and a farm called ‘Langstone’. The ‘Langstone’ element refers to a ‘long stone’ which is a standing stone or menhir which must mean that at sometime such a feature stood nearby. One mile south of the church are the remains of hut circles which date to the Bronze Age which is also from whence the menhirs originate – anything could be possible!